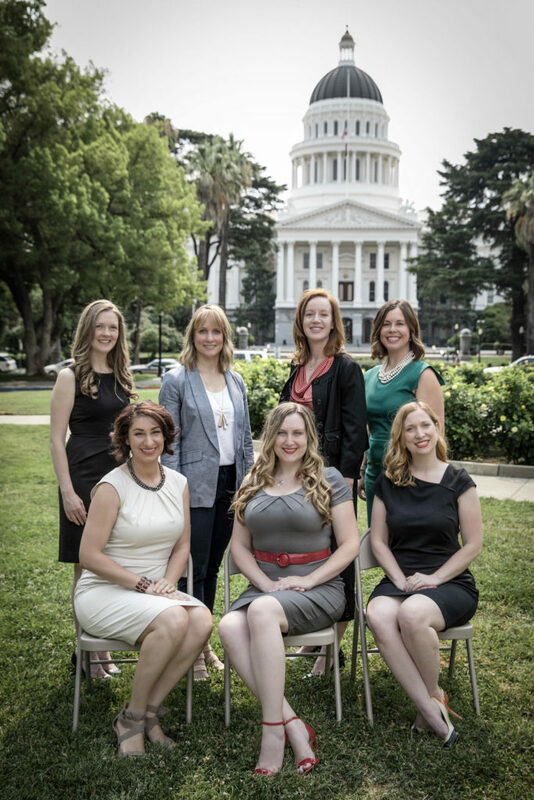 We are pleased to introduce the 2018-2019 Junior League of Sacramento Board of Directors. This dedicated group of women meets monthly throughout the year, providing governance oversight and strategic planning to the League. Members are selected through a Nominating Committee and our League year is June 1st through May 31st. Board members act as trustees and stewards on behalf of our members, including the financial management of the League. They are also responsible for the strategic direction of the organization. Each member of the Board brings inspiration and talent to the JLS. Scroll down to read information on each board member. Heidi joined the Junior League of Sacramento in 2014 to volunteer with like-minded, empowered women working to improve Sacramento communities. She joined the finance committee immediately following her provisional term, serving as Treasurer Elect for the 2015-16 league year. Her favorite part of the League is the support and camaraderie provided by league mentors. 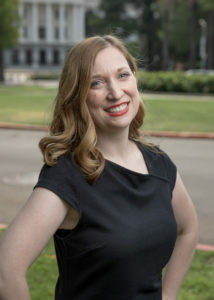 Heidi received her undergraduate degree in political science from UC Berkeley and her Master of Business Administration from Drexel University. She currently works on the economic development team at SMUD in the small business program. 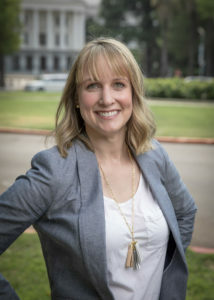 She also sits on the Leadership Council for MetroEDGE, the young professionals program of the Sacramento Metro Chamber Foundation, as well as the Friends Committee for My Sister’s House of Sacramento. Heidi lives in Sacramento with her husband Russell and son Nathan. 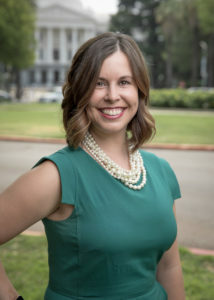 Sara joined the Junior League of Sacramento in 2015 and served on the Fund Development committee as a committee member and as the subsequent committee chair. In 2017, Sara took on a two year commitment with the League as Executive Vice President-Elect and is currently serving on the Board of Directors as the Executive Vice President. Sara obtained her Bachelors of Science degree from Auburn University and a Master’s of Arts degree from New York University. After obtaining a Master’s of Science in Education degree from the City University of New York at Brooklyn College, Sara began working as a School Psychologist. 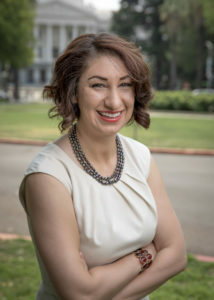 She has lived in the Sacramento region since the summer of 2014 and has been a member of various community organizations such as serving as a delegate for the Community Advisory Council for the Yolo County Office of Education, and as a past active member of the Active 20-30 Club of Greater Sacramento #1032. Sara is an alumnae of Delta Delta Delta sorority and serves as the Lifetime Membership Advisor for the Beta Pi chapter at the University of California at Davis. Sara currently lives in Natomas with her two Chihuahuas. Ruth is entering her second year as Recording Secretary on the Board of Directors. Ruth joined the Junior League of Sacramento in January 2015. She was recipient of the Annual Dinner & Membership award for Shining Members. Prior to serving on the Board, Ruth was actively involved in JL, Sacramento inaugural Touch-A-Truck in 2015. In addition to serving the League, Ruth is the Vice Chair of Northeast District California Physical Therapy Association. She has a Doctor of Physical Therapy. Ruth works as a Physical Therapist in a local hospital. Lisa is serving her second year as nominating chair on the Board of Directors. She joined the league in 2009 and has served in a variety of committee roles including training, strategic planning, membership engagement and recognition and most recently serving two years on the nominating committee. Originally from North Carolina, Lisa has a bachelor’s degree in journalism and Spanish from the University of North Carolina at Chapel Hill and her master’s in business administration from Mississippi State University. 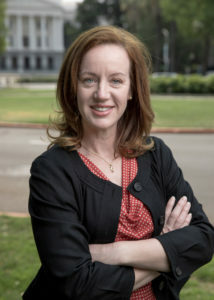 She moved to California in the summer of 2008 and began working at State Street Corporation in Sacramento where she is a Vice President responsible for client operations of a large public pension fund. Lisa lives in Carmichael with her husband Vinny and their son Patrick. Heidi joined the Junior League of Sacramento in 2016, to increase her involvement in the community and to meet like-minded women. Heidi is entering her first year on the Board of Directors as Treasurer, after serving a year as the Treasurer-elect on the management team. Heidi is a licensed CPA, and currently works as a financial reporting and analysis manager for a statewide nonprofit association. She also serves as the Treasurer on the Board of Directors for the Health Education Council. Heidi lives in Sacramento with her husband, John, and two daughters, Mikayla and Sophia. Alex is entering her first year serving as At-Large Member on the Board of Directors. Alex joined the Junior League of Sacramento in September of 2014 to meet other community service-oriented women. In past years, she has served on the Member Engagement & Recognition and Done in A Day committees, focused on membership experience as well as community outreach and service. In addition to serving JL Sac, Alex is a Past-President of the Kiwanis Club of Greater Sacramento, Board Member of Women@Morgan Stanley – Sacramento, Patron Member of the Ani Guild, founding member of Central Valley Cycling’s Charitable Association, and founding board member of Valley Children’s Hospital Children’s Advisory Committee. Alex holds a degree in Finance from CSU Fresno and is a member of a Diepenbrock Chapman investment consulting team, specializing in Foundations, Endowments, Non-Profits and Corporate Retirement Plans. Alex lives in Natomas with her husband, Jason, their daughter Gianna (1) and dog Charlie (9). Danielle joined the League in 2007 and is serving her second term on the Board of Directors as the Sustainer Vice President. Danielle has served on Community Programs in Kids in the Kitchen, Impact Sac, State Public Affairs Committee and as Corresponding and Recording Secretary. 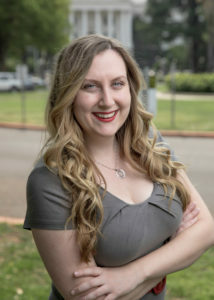 Danielle has a Master’s degree in Political Science from CSU, Chico and a Bachelor’s degree in Political Science from San Diego State University. 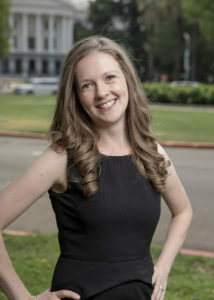 Danielle works as a Senior Policy Advocate for the California Alliance of Child and Family Services.